This is the second pattern in The Handmade Sock Society collection. There is a breathtaking magnolia tree that lives in the centre of my little city garden. It’s my own personal harbinger of spring, a queenly presence that bursts into blossom just as the weather turns the corner for good. The opulence and generosity of its deep pink blooms takes me by surprise every year, as its fragrance fills the garden with a soft sweetness. As soon as I’d decided on the theme for this year’s Handmade Sock Society, I knew I’d be paying tribute to my magnolia tree with this design. This is our second pattern of the season, and I think the Magnolia Socks will bring all of us at least a little bit of the joy I feel every time I look out the kitchen window at my tree. 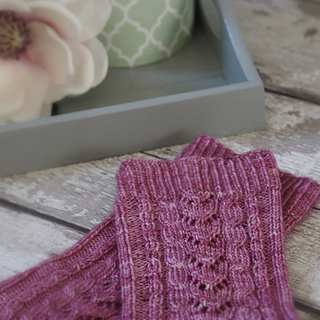 Knit from the top down, they feature a lace and cable pattern on the front and top of the foot, inspired by the branches and flowers of the magnolia. Plain stockinette on the back of the leg, a heel flap and gusset, and a round toe ensure a comfy fit. I’m also more than a little bit in love with the special yarn colour created for these socks by the wonderful Circus Tonic Handmade: Melbourne Magnolia.